Coinciding with his birthday, an exhibition from his “Green Man” series at Poets House shined a rare light on an artist who has charted an independent course. The selection of paintings and drawings by Basil King on view through spring 2010 in the new home of Poets House, in Lower Manhattan’s Battery Park City, was a small, low-key exhibition, but it marked a minor milestone for this irrepressible veteran of the New York art scene, whose work has been far too rarely shown in New York or elsewhere. 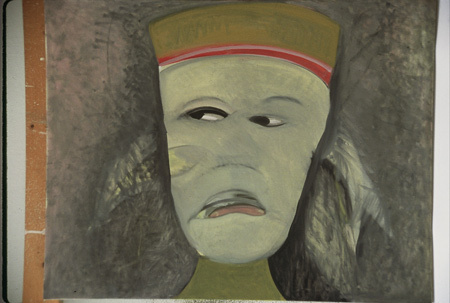 King, who turned seventy-five during the show’s run (May 30), is an alumnus of Black Mountain College, the backwater bastion of avant-garde art that existed in the North Carolina mountains for about twenty-five years spanning the mid-20th century. While other artists associated with Black Mountain (Franz Kline, Willem De Kooning, Jacob Lawrence, Kenneth Noland, Robert Rauschenberg, Dorothea Rockburne, Cy Twombly et al) gained international recognition long ago, King has languished in relative obscurity, despite his steady ouput of distinctive work, his longtime residence in New York, and close friendships with cultural luminaries on both coasts. Given the rarity of public opportunies to see King’s work, Poets House’s showing from his series “The Green Man” was worthy of celebration and a proper critical response. Despite the less-than-ideal conditions under which these pieces were presented; it was good to see them on view before a potentially receptive audience in the city where King has lived for fifty years. They offered a tantalizing glimpse of his oeuvre. Since the end of the 1960s King and his wife Martha--a writer and editor who briefly attended Black Mountain--have owned and occupied the same Brooklyn brownstone, where they’ve raised two daughters while continuing their creative work and remaining engaged with the city’s cultural life. New paintings and drawings are almost always in varying stages of progress in King’s third-floor home studio, which I’ve been privileged to visit repeatedly. But since 1979, when he had his last one-artist show in a New York gallery, his only solo exhibitions in New York have been at literary venues such as the Gotham Book Mart, the Poetry Project at St. Marks, and the Bowery Poetry Club. Veteran New York art dealers, curators, and critics know King’s name and maybe a little about the art, but he remains without a New York gallery affiliation, and he has never had anything resembling the proper retrospective his work deserves. Poets and poetry-centered organizations have been receptive to King’s art because of his longtime interest in poetry, his friendships with important American poets, and the fact that, since the mid-1980s, he has nurtured his own poetry career. Although a relative late-comer to poetic practice, he evidently retained plenty of what he picked up in his studies at Black Mountain with Robert Creeley, Robert Duncan, and Charles Olson. He writes like none of them, but there’s a clear literary kinship. Seven of his books and six chapbooks have been issued by small-press publishers such as Cy Gyst, Marsh Hawk, and Spuyten Duyvil, and his poems have appeared in a number of independent print and on-line magazines. Some of his drawings have been reproduced on the covers and inside pages of his own books, and others have appeared in literary magazines and books by fellow poets including Paul Blackburn, Allen Ginsberg, and LeRoi Jones. His identity as an artist first and foremost (and one with a formidable knowledge of art history) iis reflected in the fact that much of his poetry is about visual art, artists, and art-making. That King’s own art has been so consistently neglected is inexcusable, but I suspect commercial and curatorial resistance to the work stems from its unfamiliarity and refusal to fit neatly into existing categories. King’s strikingly idiosyncratic paintings occupy their own aesthetic terrain, so the standard brushoff line of all gallerists when rejecting an artist’s work-- “It doesn’t fit with what we’re showing.”--is, unfortunately, always applicable in his case. His career illustrates some of the perils of going one’s own way in an increasingly systematized, globalized art world. The uncompromising integrity of his vision is matched by the determined perseverance with which he has pursued it in spite of the long odds. He has, in Duncan’s words, kept the ability to respond. Like other artists who were students at Black Mountain in the 1950s, King painted in an abstract-expressionist vein at the outset of his career, but he abandoned this way of working when he was in his late twenties. At the time he was a new father feeling increasingly dissatisfied with his art and out of step with his generation, and the resultant stress triggered a nervous breakdown that creatively immobilized him. After a hiatus of about two years and a reassessment of his creative priorities, King resumed painting and experimented for several years with a repertoire of biomorphic shapes. Eventually such forms evolved into--or were replaced by--loose depictions of figures as King began developing a more personal approach, applying his own kind of gestural, painterly, ab-ex treatment to recognizable but sparingly detailed imagery. He has continued to pursue this evidently fertile line of visual investigation in subsequent years, producing substantial results in the form of several hundred paintings and countless drawings. One of the singular aspects of the hybrid vision King has evolved over the last forty years is the way his imagery often appears to be emerging from or slipping into murky, abstract space. To my mind the vaguely defined figures in some of the paintings suggest ghostly apparitions undergoing a process of metamorphosis or mediation between worlds. 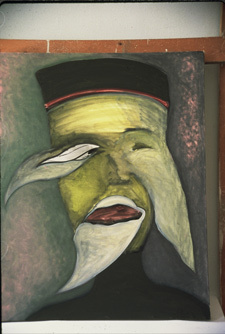 In the case of “The Green Man” series, the operative mediation is between human identity and nature. All thirteen of the paintings are tightly composed oil portrait busts of figures wearing fez-like headgear. King made them in 1996 following a trip to England, where he was born and lived until he was twelve. Their inspiration was the carved figures that have come to be collectively known as the Green Man, incorporated into the architecture of England’s medieval cathedrals. For the first time during that trip he paid close attention to these figures, with their faces peering out from dense growths of leaves and vines. In the centuries since they were sculpted by anomymous artisans, they have been symbolically associated with the energies of the forest and the forces that inspire artistic creation. In King’s variations on the archetype, leaf-like forms are often incorporated directly into the facial features--as lips, eyebrows, or mouths, as if cellulose and human skin were equivalent. In one painting two symmetrically intersecting paisley shapes that resemble leaves (or a pair of disembodied bird wings) are superimposed directly over the eyes to create a kind of racoon-face mask. In another a leaf-like form superimposed over the face’s single, cyclopean eye also reads as the profile head of a bird whose long neck runs down along the nose-line to the leaf-like lips. King has characterized these paintings as “portraits of the Green Man’s facets,” and because of the Green Man’s English origins he has given them single-name titles he associates with English historical figures--Guy(Fawkes), Robin (Hood), (Christopher) Marlowe, Horatio (Nelson), and Walter (Raleigh). The palette features shades of green, of course, and also includes other colors typically found in forested landscapes--grays and browns, as well as the pink, orange and white of certain wildflowers. 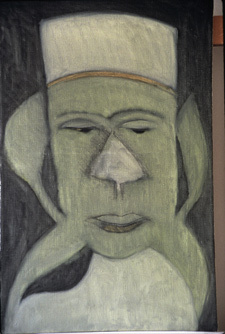 Other hues are employed in three thematically related, untitled drawings also at Poets House, all from a 2009 series called “Looking for the Green Man.” Each of them features two or more abstracted, faceless figures presumably representing seekers of the creative, regenerative energies the Green Man emblemizes. The group of six standing figures in one drawing suggests an entourage of pilgrims, while four dark-clad figures in another are huddled together as if in a strategy session. In the show’s most striking drawing, a blue birdlike entity stands or perches alongside a yellow figure of about the same size, more amorphous but vaguely humanoid--a suspended moment from an interspecies encounter. At Poets House King’s paintings and drawings were dispersed among in-service bookshelves and other furnishings in three separate rooms, and none were accompanied by wall labels, nor was there any other wall text to identify the artist or briefly summarize the unifying theme of the works. Poets House made this information available only in the form of a two-page printed handout that was easy for visitors to overlook. To be fair, Poets House makes no pretense at being an art museum or gallery, and the organization is still settling into its new digs. Due to the frequent intersection of poetry and visual art in collaborative projects, illustrated books, and poet-penned art criticism, it makes good sense for Poets House to maintain some kind of art-exhibition component. But the set-up in the new headquarters doesn’t lend itself very well to that purpose, so I hope the directors and staff give some thought toward improving accomodations for the art they show. With that caveat, Poets House deserves credit for exhibiting the work of this undeservedly neglected, autonomously motivated, boundlessly inspired artist. It remains to be seen whether this small selection might have caught the eye of anyone with the capacity to mount a larger, more proper exhibition of King’s workk. That would be the best-case scenario, but one knows better than to count on such responsive attention in a world where just about everyone has gotten too busy to look, much less to see. “The Green Man: Paintings and Drawings by Basil King” was on view from March 20 through June 12, 2010, at Poets House, 10 River Terrace (at Murray Street), New York; more information from www.poetshouse.org; phone (212) 431-7920.